It was a hot August night in 2005 BC (Before Castellini). Griffey Jr. was healthy again, or as close to healthy as he ever would get wearing Red. I was taking my 9 year-old son, Zachary, to watch his beloved Redlegs on a perfect evening for baseball. The San Francisco Giants were in town and seats were plentiful as the Reds were plodding toward another forgettable season and the rest of the populace was turning its attention down the street to the local NFL team. I easily found prime seats just off the side of home plate toward the third base side in Section 119. Zachary was sitting closer to the field than he ever had, closer even than he normally sat at Keyspan Park, the tiny and intimate Single A home of the Brooklyn Cyclones. Being a Cincinnati-ex pat, each year we make a midsummer pilgrimage to GABP. We drive the final miles and come out through the Lytle Tunnel to the sight of Joe NuxhallÃ¢â‚¬â„¢s famous and comforting words, Ã¢â‚¬Å“ROUNDING THIRD AND HEADING FOR HOMEÃ¢â‚¬Â and know that yeah, we are. A little bit of wonder was being played out before my son as he attended these games. At some point early on, he told me that every time he saw the Reds in person, Griffey homered. I laughed, but out of curiosity, I went back and traced the games weÃ¢â‚¬â„¢d been to for the past two or three years via old ticket stubs from GABP and New YorkÃ¢â‚¬â„¢s Shea Stadium and sure enough, he seemed to be right. So, here we were, another night of waiting for Junior to go yard, my son chattering on, anticipating exactly when it would happen. Being the adult (a fact of some debate if you know me), I knew the streak had already gone on far too long and, like water seeking its own level, was due to find a predictable if unceremonious conclusion. Every game seemed a likely unhappy ending in the making and that night was no exception. Junior had failed his downtown duty in each of his previous at bats that evening and was due to make only one more appearance in the bottom of the 9th. The two, thirty-something fellas sitting directly in front of us had taken considerable delight in the back and forth between me and my son through the first 8 inningsÃ¢â‚¬â€particularly my sonÃ¢â‚¬â„¢s unshakable belief that Griff would come through once more on cue, simply because he was there. There is something magical about a 9 year-old boy at a baseball game. The innocence. The wonder. You probably know what IÃ¢â‚¬â„¢m talking about, but if you donÃ¢â‚¬â„¢t, go grab a kid off the street if you must. Sit next to him for 3 hours at the ballpark. You wonÃ¢â‚¬â„¢t regret a moment. Zachary erupted with a plaintive and disbelieving cry:Ã‚Â Ã¢â‚¬Å“YouÃ¢â‚¬â„¢re bunting!?? The paid attendance that night was 16,954 and more than half of them were probably gone by now. ZacharyÃ¢â‚¬â„¢s accusation rang out. Griffey surely heard my sonÃ¢â‚¬â„¢s wail, our proximity was so immediate.Ã‚Â I was slightly embarrassed. We were so damn close to home plate. I waited for No. 30 to turn around, to glare in the direction of the voice so foolish to question the great man. But, he went about his business, letting the remark pass. He drove the the next pitch deep into the night. To say we were beside ourselves is almost beside the point. I picked up my young son and raised him over my head, shaking him like he was a piÃƒÂ±ata full of fifty-dollar bills. He laughed, I roared, and the two fellows in the row in front of us?Ã‚Â Well, letÃ¢â‚¬â„¢s just say they became believers. The streak did finally come to an end, but not before several more games would be watched.Ã‚Â Two seasons later on a summer June day, I was still telling Zachary this was the day the streak would end. Griffey would, of course, homer on his first at bat of the game while I was standing in line waiting for cheese coneys, my son shaking his head at me before I could even get to my seat. Father. Iowa born, Kentucky raised, NYC finished. I write about baseball. I wonder what Willie Shakespeare would have written had he met Willie Mays. Richard resides in protective custody at an undisclosed location in New Jersey. So, basically, Baker is saying that he will bunt in this situation every single time. The man is just a robot, he’ll do this every time, and it’s idiotic. I don’t know what else to say. John Erardi had a whole thing about it, quoting Earl Weaver saying that you don’t want to take the bat out of the hands of your two best hitters. Now, Phillips isn’t the 2nd best hitter on the team, but whoever the Orioles’ best hitter under Weaver was isn’t nearly as good as Votto. I wonder if this applies every at bat that Phillips has with Choo on first, then. Wouldn’t want to hit into a double play! @Hank Aarons Teammate: Okay, assuming BP slides back to the #4 spot, Votto gets on base on something like 42% of his at bats, & 31% of his plate appearances, he’ll get a walk or hit a single. That’s a scary amount of sacrifice bunts. Clearly, Dusty means he’ll only do this in high leverage situations in close games (i.e. someone can hold the manager responsible for letting BP hit into a double play), but still…. I grew up playing baseball, from little league to High School Varsity, and even a little ball now in college, and as bad as it sounds, this is technically strategically sound on paper. But for the moment and flow of the game, I was very upset Dusty put on the bunt. I don’t have much room to criticize a major league manager, but if Dusty has a fault its that he sticks to the script, even when the flow of the game begs otherwise. Thats my very humble opinion. @Ducksonthepond: It’s strategically unsound. I grew up playing baseball too. @Ducksonthepond: Sacrifice bunting is ALMOST always strategically unsound in MLB. One of the reasons the MLB is so popular is that such a large % of fans actually got to play the game when they were between ages 6-18. This means that their coaches not only drill them on what the “fundamentals” are, but they also feel like they know what they’re talking about. But major league baseball isn’t knothole ball. The difference between MLB-caliber fielders and even the highest level minor leagues & the MLB is ridiculously extreme. Yes, there are circumstances that can change this (for example, if the 3B is named EE), or if the pitcher is a terrible fielder. The average NCAA third baseman stinks compared to the average AAA third baseman, who stinks compared to the average MLB third baseman. Since the run expectancy is only fractionally larger not bunting versus bunting, the level of fielding quality makes a HUGE difference. Bunting therefore makes a lot more sense each level you move down baseball (although, probably not to the extent that NCAA coaches do it, i.e. having their best hitters bunt). You’re bunting more for a basehit/error, less to avoid the double play (which is also corresponding lower due to the shoddy fielding). Heck, bunting may be strategically sound all the way through AAA. @CP: In little league, managers love to show how smart they are by bunting. This, despite the fact that runners advance on wild pitches or passed balls about once every three pitches! Great story about Griffy’s homers. Rich is also 100% correct about being at a game (baseball, basketball) with young kids. I’ve taken my twins to the local A league team (Wilmington DE Blue Rocks) and even while they were not even three at that point they were enthralled. It was great. I hope to get down to a Phillies/Reds game this summer. That might just cook their melons. @Jared Wynne: It makes no sense whatsoever. Except in Baker’s mind. It was a tight, low scoring game. Dusty was playing for one run. He was taking the guaranteed route of putting a runner in position of scoring on a sacrifice fly. If someone got a hit, all the better, but he was playing the odds of putting a runner on third and giving them a shot to score even on outs. If Dusty didn’t do that, someone would HAVE to get a hit to score. With Dusty’s strategy, someone could ground out or flyout and it would still lead to a score. In a low scoring game, you have to scrape for those runs. @CI3J: My feeling is, if you trust a guy to be your clean up hitter, then you ought to trust him to swing the bat with runners on late in the game WITH NO OUTS. Right? Isn’t your cleanup hitter, by definition, the guy that the manager feels most (or minimum, second most) comfortable hitting in that situation? I just think its an odd call. One that is made doubly odd by BP’s pending promotion (demotion?) to cleanup. AWESOME! story man.. TBH i teared up a bit…. I cant wait to take my 2 year old to some ball games 🙂 i have yet to make my pillgramage to GABP.. or Any of the reds stadiums… I was watching the game with my dad monday and i told him we have to go one day! John Erardi and our friend, Joel Luckhaupt, have an article on just this subject in today’s Enquirer. @Bill Lack: I said that, I liked where he pointed out that you can count the current MLB managers who wouldn’t have bunted in that situation on one hand. @redsfanman: I meant “I saw that”, not “I said that”. Whoops. If Dusty didnÃ¢â‚¬â„¢t do that, someone would HAVE to get a hit to score. With DustyÃ¢â‚¬â„¢s strategy, someone could ground out or flyout and it would still lead to a score. In a low scoring game, you have to scrape for those runs. I just wonder how much smarter Brandon Phillips’ bunt would have been if a later hitter had gotten an RBI single. All of your posts are simply fantastic. If possible, please keep ’em coming! Bunting… It’s kinda like get’n a handy… it’s okay I guess, better than nothing but not really what I’m after. Let the pitcher bunt. Ever’body else, swing the #&&$#ing bat. Wonderful story, I loved it. Not many people note or recall the remarkable comeback that Junior had in 2005. During the preceding off-season, he had the surgery that re-attached his hamstring to the bone. That was the first time a major league player had ever had that surgery, and it was not clear that he could come back at all. He virtually skipped spring training that year and as of April 30, he had zero HRs and was batting about .220. Retirement seemed possible. But he hit his first HR on April 30 and went on a tear that lasted right into Labor Day Sunday, at which point he had 35 HRs and was batting .301. On that day his season ended, as he turned his ankle rounding 2nd base during a game winning 9th inning rally during which he had a critical hit. For those 4+ months Jr. was young again, hitting like he did in his prime as a Mariner. His 2005 .301 average and .576 slugging pct. were his best as a Red. @pinson343: HEY!!!!!!!!!!!!!!!!!!! GREAT TO HEAR FROM YOU!!!!!!!!!!!!!!!!!! On the subject of BP bunting, I can recall many times that BP’s been at bat with runners on first and second and none out, and Dusty has had him bunt. When BP is batting first or second in the lineup, it’s just about mandatory for Dusty. I never like it, but in this case I hated it. Dusty did not seem to account for the fact that Chris Heisey had been inserted into the lineup as the cleanup hitter. I have nothing against Heisey and I’m a big fan of Jay Bruce, but there’s no way that you have a better chance of scoring with them coming up with the bases loaded and 1 out than you do with runners on first and second, none out, and BP and Votto coming up. Read that whole thing with a big grin on my face. Excellent story, Sir Richard. The Reds will call up one of their AAA OF, most likely Perez. That more than likely will last just a week or two. However, WJ and the Reds are having discussions with the Angels brass about LF/1B/DH Mark Trumbo. Trumbo fits the needs of the Reds the most. Young, inexpensive, has power, can hit 4th and drive runs in. Also the Reds have contacted the Blue Jays (R. Davis and Bonifacio) and Royals (Cain, Butler, and Dyson) about their surplusses of RH hitting OFers. A deal may not be imminent, but I would say it will probably be done before the end of April. With Pinson343 and Travis G posting today I feel like playing The Boy are Back in Town. Great story. Here’s hoping your son finds another Reds player to be a good luck charm to, and that he attends many a game. @earmbrister: Thanks. It’s lonely for him being a Cincinnati fan up here in Yankee/Mets country. But he perseveres. He’s got himself a Jay Bruce replica jersey, but Junior will always be his guy. I read once (and I can’t find the article now) that the coaches who are the outliers, the ones who take the proper risks were the ones with greater job security, like Bill Belichick, Bill Parcells and Joe Gibbs. The theory was that they could stand up to being second guessed for taking unconventional, but proper, risks. But in baseball, it seems the opposite. The older, more established coaches, like Dusty (and not just him), are the ones who go with the bunt more often. Maybe it isn’t exactly a generational thing. I don’t really have an explanation. Just thought the comparison to football coaches was interesting. I just think that when the “book” was written in bunting automatically, it was assumed that the batter(s) who came up after bunter would put the ball in play, increasing the chances of scoring a run. Now, with little to no shame accompanying high strikeout totals, you significantly increase the chances of what happened Monday. And take the bat out of Votto’s hands at the same time. … And that’s not even counting the Heisey-in-for-Ludwick factor, which wouldn’t have made me like the move, just perhaps dislike it a little less. Mr. Fitch, well done, sir. I have a 4-year-old whom I can’t wait to indoctrinate. But right now she’s pretty stuck on Strawberry Shortcake and Dora the Explorer. Pinson, glad to see your return!!!! Great story on Junior’s home runs. 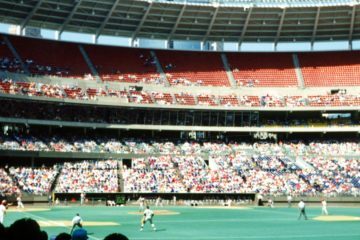 Growing up in Arkansas, I rarely got to see the Reds play. I went to 3 Reds games and he was hurt every one. My 4th Reds game was with my dad at GABP in July 2006 against Milwaukee. Junior was healthy and in the lineup, and then a rainstorm came. Thankfully it was only a 3-hour delay instead of a cancellation (we couldn’t stick around for the game the next day because we would be heading to Cleveland on stop 2 of our 6 ballpark, 7 game in 7 day trip through the midwest). Junior had an awful game, until the 9th inning when Derek Turnbow did what he does and blew the game, and Griff hit a bases loaded double to win it. Sure it wasn’t a bomb, but that was probably my favorite moment from my favorite player. Anyways, on bunting. I was upset about the sac bunt. He effectively took the bat out of 2 of our best hitters’ hands. Absolutely unacceptable. I’m not a Dusty hater, but his stubbornness costs us from time to time.